I expect Gimli the dwarf enjoyed a bit of light knitting of an evening while he rested from the day’s battles, and so it’s been with me. 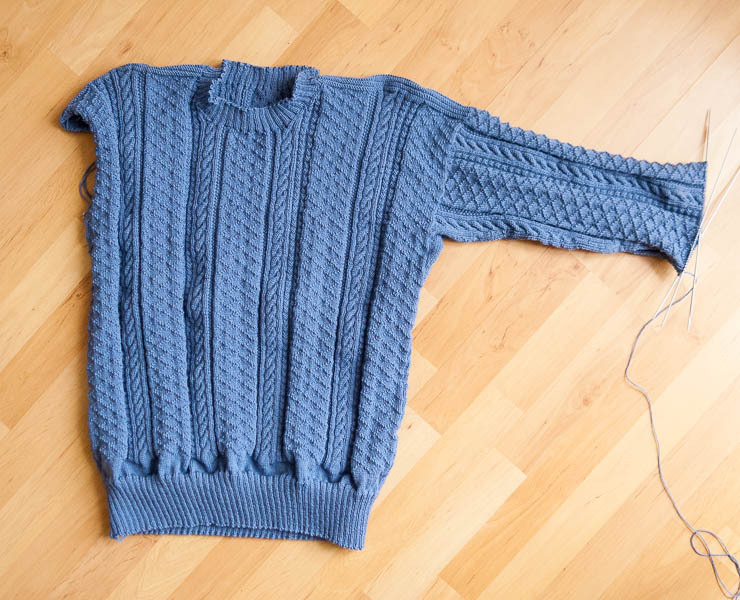 I’m zonking down the sleeve, and may even finish it this weekend. (Maybe not, though – I plan to do a six-inch cuff.) I’m decreasing at a rate of two stitches every 7th row, and should end up with c.96 stitches for the cuff – if I’ve got my maths right. 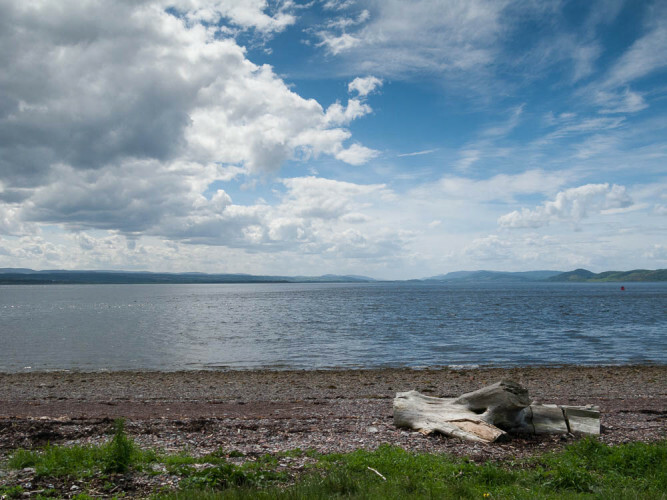 If you’re ever in the Highlands I recommend a visit to the Black Isle, just north of Inverness. It’s not really an island, but somehow the “Black Peninsula” doesn’t quite have the same ring. It’s fertile and green and wooded, not really words that you can apply to Caithness with a straight face, and with its yachts and marinas and general air of prosperity looks like a little bit of Cape Cod in Scotland. 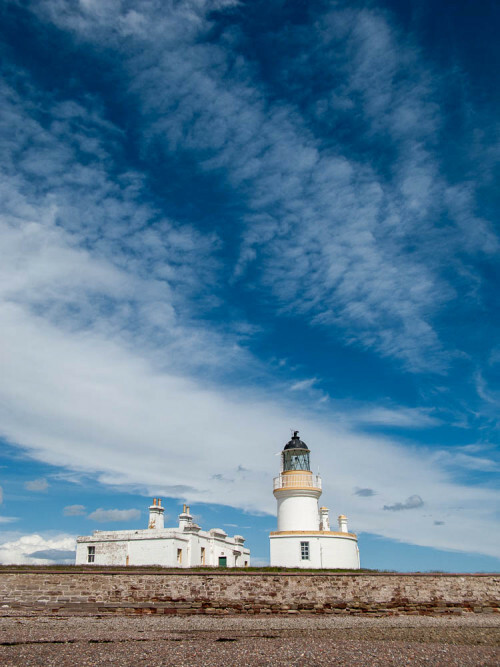 The Black Isle also has Chanonry Point near Fortrose, a long spit of land jutting out into the firth. We were there last weekend – it’s supposed to be a great place to see dolphins, and although there were none frolicking while we were there, we did spot a rare ice cream van, which in many ways on a hot day was even better. Gosh, what an interesting week and epic song as well. Really good progress on the gansey, it seems to me that the whole top is starting to take on a finished shape, such a lovely colour as well. In the South the weather is pleasant, the big ducklings have been joined by a sweet little peachick, and the cats still have ticks! Please excuse my ignorance, what is a blowfly? We have house flies and fruit flies, but blowfly is new- I have a vague literary association with corpses in my mind. Anyway, good luck with that…. ewww. 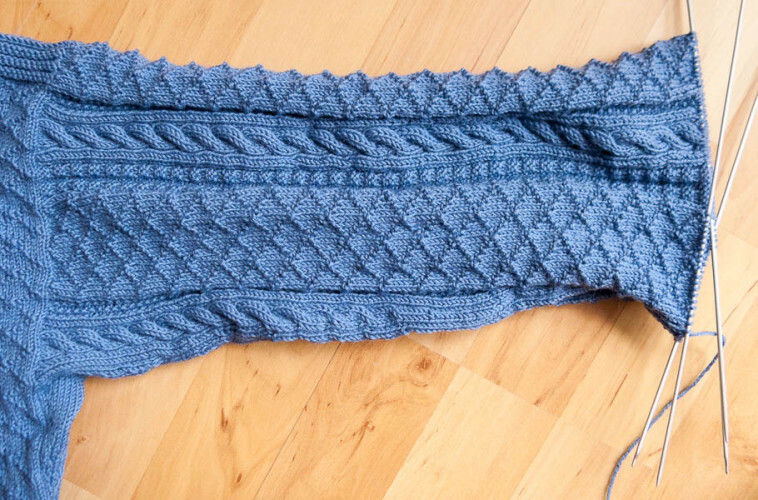 The knitting is really shaping up, I am really liking the strong clean lines. Good knitting and carry on. P.S. In the 70’s I was interested in the Findhorn community on the Firth of Forth. Do you know it? Actually, they’re probably house flies, you’re right. To be honest I didn’t look too closely as the Paper Towel of Destiny descended! Blowflies get their name from their habit of settling on old meat and laying eggs, so that the meat became known as “fly-blown”. Again, please could you tell Margaret how wonderful her photos are, I particularly enjoyed the Giant Hogweed. By the way I think the Black Isle and dolphin watching pop up in Ian Rankin’s return of Rebus book, “Standing in Another Man’s Grave”, a super read. Make the most of Margaret’s pictures, as it’s only a month before she’s off on her travels again and you’re stuck with me and my iPhone!